Have you booked your tickets yet? Be sure to be in Bangalore this weekend, for the Big Bang on the 19th of May at ITC, Gardenia. The summer trainees are working hard to organise a memorable evening under the guidance of the Bangalore XLRI Alumni Committee. Spot prizes, wet nite nostalgic music, OMAXI style bar, and an assorted menu to boot. Our Beverage Sponsors Pernod Ricard (Seagrams), Pepsi and UB - United Spirits will ensure that inspite of heavy graxing and trying to hold conversations louder than the music, your throats will not run dry. Thanks to Madura garments for the special XL T-shirts and offering of free Loyalty Club membership to all attending Alumni. Those attending also stand a chance of winning a 2 day (one night) Bed & Breakfast package for 2, from Windflower Resorts & Spa at Wayanad (Kerala). Metro has sponsored assorted gift hampers for some lucky XLers!! Other than Sponsorship leads and offers, what we would really like from you is to get talking, emailing, calling and motivating other XLers in your office and batch/friend circle to attend. Its Herculean for us to reach out to everyone. 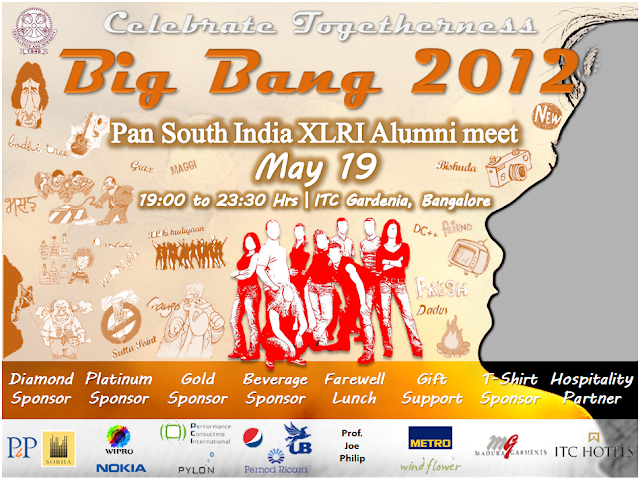 email addresses are dynamic and not everyone in Bangalore is signed up on xlbang, we would really appreciate your spreading the word. Please forward this invitation to all your XL based groups.